Jeff Shaara is gifted. He has an idiosyncratic ability to enliven history, both in the lessons and especially in the personalization. His story telling ability is lively and emotional. In his latest THE SMOKE AT DAWN, not only does he maintain this tradition, but he may have improved upon it. My first Shaara reading was his GODS AND GENERALS. After all these years, I can still mentally picture Stonewall Jackson sucking on a lemon, strategizing the consequences of his imminent future. While Shaara paints his historically accurate images, he weaves in the familial relationships and conversations. In THE SMOKE AT DAWN, those connections have strengthened or weakened to new levels. Fathers have lost their sons; brothers have drawn blood from one another; former war friends are laying siege on each other. While one side may declare a victory, neither side feel they have truly won. Helpful are the maps, as always before. In his more recent novels, included are small such things as chapter-heading flags to help guide the reader to know which “side” they are reading about. It all weaves together into an easy to understand format that’s quick to be absorbed. On a related note, as the author mentions in his introduction, if you have the opportunity to visit one of the Civil War battlefields, do so. 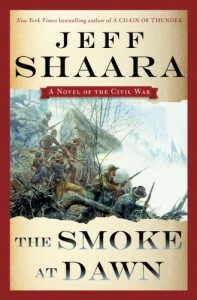 After reading Shaara’s other works, my visit to Gettysburg was awe-inspiring. Whether you have read his previous works or if THE SMOKE AT DAWN is your first introduction, you would be remiss to pass along Shaara’s writing. Not only will you learn, but you will be touched. Thank you! to Ballantine and Random House for providing an electronic review copy of this book. The galley I received did not have the maps yet, but I was able to see the first map in the preview; they appear just as helpful in understanding as his other books.